There are many different opinions on how much water you should be drinking every day. Health authorities commonly recommend eight 8-ounce glasses, which equals about 2 liters, or half a gallon. This is called the 8×8 rule and is very easy to remember. Studies have shown that drinking water naturally boosts your metabolism among other water health benefits, and drinking infused water for weight loss can be an easy way to increase your water intake. 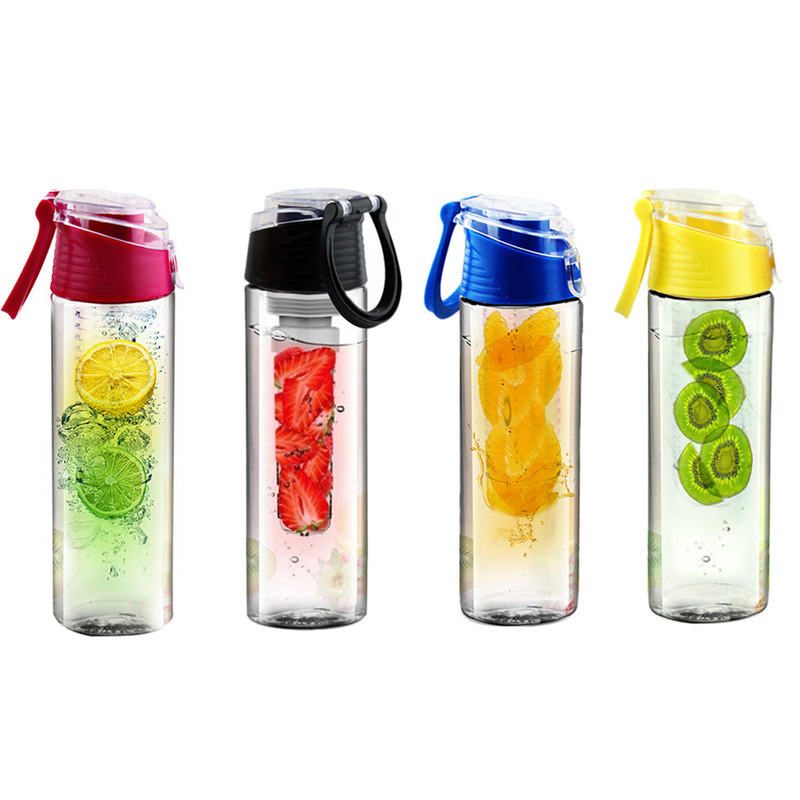 With one of these fruit infuser bottles , you can refill the water over and over again and the flavor of the fruits and herbs will still infuse into the water. It’s worth the $7-20 investment in your health! Studies have shown that drinking infused water may help improve weight loss and support long-term weight loss maintenance. Drinking water increases the amount of calories you burn by as much as 24-30% within 10 minutes of drinking water, and this water weight increase can last for as long as 60 minutes! Being that fruit infused water contains extra nutrients, you naturally feel fuller after drinking it compared to normal water. At the same time, by swapping fruit infused water for sugary drinks, you’ll start consuming fewer calories that bring you no health benefit. Combining this with a healthy, clean eating diet, will help you maximize the rewards. So, by this time you should be sold on the benefits of infused water, and no doubt you’re already thinking of exotic concoctions and combinations that you want to try. The important part is deciding how you will go about making your own infused water. It’s best to, if possible, start with filtered water and then fill it with the combination you want to try. In general, citric juices like lemon are absorbed very quickly, whereas things like herbs and berries take a few more hours to properly infuse into the water. So that’s why it’s often a good idea to leave it in the open for a couple of hours and then place in the fridge for a few more hours or overnight. Then all you need to do is simply pour out the water you need. You can refill the water as you use it, though, of course, the water will become far less infused and flavorsome. In this case you can always add more ingredients throughout the day. Once you’re done with a batch of fruit, you could include it into a smoothie so as to not let anything go to waste and to obtain the full range of health benefits. The best tool on the market for this is Pro Fuse. Pro Fuse is a specially designed water infuser that helps you extract the greatest amount of vitamins and nutrients as possible from your fruit and vegetables and access the full diverse range of health benefits contained in infused water. Instead of having to fill up your glass from a fridge throughout the day, Pro Fuse is portable and perfectly designed for use whilst travelling, at work or at the gym. The important thing here is to focus on drinking a good amount of water every day so that you feel replenished and hydrated. Add the ingredients to a glass or mason jar (approximately 16 ounces/500mL), fill it with filtered water, and allow it to sit covered in the refrigerator for approximately 24 hours. The key is to get a hint of lemon because it can easily overpower the taste of the other ingredients. If the lemon that you are using has a thick pith (the bitter white part underneath the colorful outer skin), you can remove before adding it to the water. If you would like to bring out the gingery taste, try scoring the ginger piece to release the juice. Add the ingredients to a glass and fill it with water. Let it sit for 12-24 hours before drinking it. Use a firm pear, as a ripe pear will get mushy when soaked in water. The pith (the white part under the orange peel) tastes bitter, so be sure to remove it. Fill it with water and put it in the fridge, covered, for 12-24 hours. To make grapefruit and thyme water, add the following to an 8 to 16-ounce glass. Be sure to peel the grapefruit (removing the white pith). Cut the grapefruit slice into pieces or segments. Add a small piece of thyme. Fill the glass with water. With the subtle flavor of sweet anise, fennel and apple go well together in this infused water. To make it, add the following to an 8 to 16-ounce glass. Fill the rest of the glass with filtered water, and allow it to sit in the fridge, covered, for 12 to 24 hours. Squeeze the juice from a small lemon wedge into the glass. Fill the rest of the glass with filtered water and allow it to sit, covered, for 12 to 24 hours. 1 lemon slice, cut in half. Very small piece of dill weed. Fill the rest of the glass with filtered water. Place it in the fridge, covered, for 12 to 24 hours. Notes: Removing the pith of the lemon (the white part below the outer bright yellow skin) before infusing the lemon will prevent the water from becoming bitter. Add filtered water to fill the rest of the glass. Cover it and allow it to sit in the fridge for 12 to 24 hours. Fill the rest of the glass with filtered water and place it in the fridge, covered, for 12 to 24 hours. Make lemon water by adding a 1/4 of lemon, sliced, to an 8 to 16-ounce​ glass and then filling the rest with filtered water. You can allow it to sit for 12-24 hours or just squeeze the lemon juice right into the glass. If you choose to infuse it, remove the pith (the whitish part underneath the colored outer portion) before placing the lemon in the glass to prevent it from becoming bitter. Add a small slice of peeled ginger for a spicy kick. Citrus fruit (lemon, orange, grapefruit) has a bitter white part, called the pith, underneath the outer colorful portion. It can make the water taste bitter, so it’s a good idea to remove it before adding any citrus fruit. Precise measurements of fruit and vegetable slices aren’t really necessary. If you prefer cucumber over lemon, for example, you can alter the ratio to suit you taste. You can strain the fruit and vegetables out of the water, if you’d like, and eat them separately. Make no more than a day’s worth at a time as the fruit tends to get soggy. Avoid drinking fluids too quickly. Also, avoid excessive or regular consumption of lemon or other acidic drinks as they can soften tooth enamel (read more about the possible benefits and side effects of lemon water). Certain ingredients should not be consumed in excess by people with certain health conditions. For example, citrus fruit, ginger, and mint may trigger heartburn and excessive ginger intake may increase the risk of bleeding in people with bleeding disorders and those taking medication that increases the risk of bleeding. For some people, drinking too much water can be a problem. Be sure to check with your healthcare provider before making changes to your diet, particularly if you have a health condition (such as diabetes insipidus) or are taking diuretics or other medications.